When they told me I could bring home-cooked food, my eyes lit up. Finally, something I could do besides fluff pillows, worry, and arrange blankets. Unfortunately, he was put on a ventilator the day before the surgery, so that was the end of my cooking for him, but I'm keeping this recipe handy so I can make it for him when he's again able to handle "real" food. Since potato soup was on their liquid-diet menu, I decided to make my own version. Trust me, if you're on a diet, you don't want to make this. If you're not on a diet and want to stay at normal weight, you don't want to make this. But if you need to pack on some weight, this ought to help. I'd like to point out that it's not heart-healthy, nutrient balanced, or in any other way good for you. It tastes really good, though. And it would be pretty easy to lighten up. The chicken stock I used was home made, but a good-quality purchased stock would be fine. The one I used was reduced a lot, so it was very flavorful and gelatin-rich. It was also very low in salt - I always make my stocks with just a small amount of salt, because it's easy enough to add that later. That's why you need to taste it as it's finished - if you're using a commercial stock, it might have plenty of salt, so you might not need any more. I considered adding cheddar cheese to this soup for a little more protein, but I wasn't sure if that would push it over the boundary as far as what's considered liquid. If this was something that I would be feeding him on a long-term basis, I'd look into what sort of supplements I could add. This was just for the short term, though. Melt the butter in a large pot (I used a large saucier from Anolon) and add the onion. Cook until the onions soften, then add the potatoes. Cook for a few minutes, stirring as needed. Ad the chicken stock. This should be enough to cover the potatoes. If not, add more stock or water to just barely cover the potatoes. It's fine if a couple edges stick out. Bring to a boil, then lower to a simmer. Cook, stirring once in a while, until the potatoes are soft. Take the soup off the heat and let it cool for a minute or two. Add the cream, pepper, and dill weed. Use a stick blender* to puree the soup until smooth. Taste for seasoning and add salt, as desired. If it needs to be reheated, do it gently to avoid curdling the cream. *If you don't have a stick blender, you can puree the soup in a blender. Do it in small batches or you risk having the soup blast out of the blender. You can also puree this in a food processor. With my husband in the hospital, my meals need to be quick. I usually don't leave the hospital in the evening until I realize that I'm hungry - and although its just a short drive home, by the time I get there, I'm ready to gnaw an elbow off. If I don't have something planned, I'm doomed. That's when I end up eating peanut butter on graham crackers for dinner. My best plans involve having something in my crockpot, so it's hot and ready to eat when I get home. This roast pork was perfect. And, yes, I said roast. Not braised. I used my Ninja Cooking System (read my review here) to roast a small pork shoulder roast, and served it with mashed potatoes and Brussels sprouts. This was probably one of the cheapest meals I've made. The pork shoulder roast was on sale, and then I had a $5 coupon. So a 2 1/2(ish) pound roast was under $1. That's a good deal. The potatoes came from a company that was promoting their new breed of spuds - Rooster potatoes. So those didn't cost anything. And the frozen Brussels sprouts were on sale. Cheap. And considering my budget lately, cheap is really, really good. The Rooster potatoes are very popular in the UK, and according to Wikipedia, they're the most popular potato in Ireland. Now they're being grown right here in my home state of Colorado. Local is good. Are potatoes really that different? Some people might say that the only important differences are red vs. white, but since I've been buying potatoes from the farmer's market, I've become a bit of a potato snob. The ones from the grocery store are pretty bland in comparison to the ones I buy from the local farmers. I was curious about these new potatoes, and I gave them the ultimate test - mashed, with just salt, butter and milk. Some people rave about their marvelous mashed potatoes with all sorts of flavorings like garlic or herbs of cheese. There's nothing wrong with that - I like to add sour cream for the added richness and tang. Of course all those additions make the potatoes good. But plain mashed potatoes ... well, they're pretty plain. That's why there's gravy. The mashed potatoes I made from the Rooster potatoes were probably the best mashed potatoes I made in a long time. Perfect texture and great texture. Maybe it was just a fluke and I happened to cook them perfectly, but they were at least as good as the farmer's market potatoes. At least. Maybe better. I don't know if it's the variety of potatoes, or that they were recently harvested and locally grown, but they were pretty darned good. But back to the pork roast. This is an incredibly simple recipe - basically just a roast pork shoulder. I slathered it with a Hungarian pepper spread - just slightly spicy. You could use anything you like - mustard, barbecue sauce, or any spice rub you like - or just salt and pepper, if that's your preference. 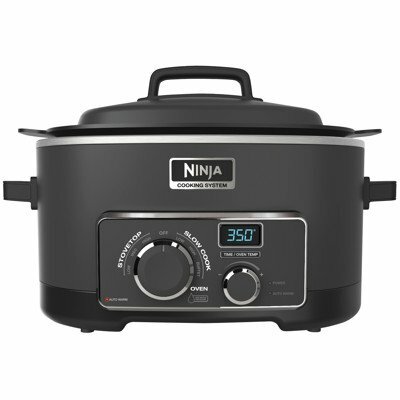 The Ninja Cooking System has an "oven" setting that allows you to roast meat in the cooker. This might work in a different slow cooker, but I haven't tested that. 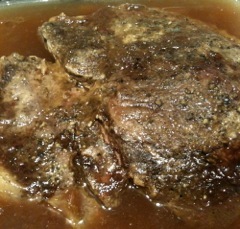 Slather the roast with your preferred sauce or spread, or sprinkle with salt, pepper, herbs, or spices, as desired. Place on a rack in your Ninja Cooking System (or other similar cooker) Put the roast on the rack, set the cooker for 300 degrees, and set the time for 3 hours. When the time is up, check the meat - it should be fork tender. Remove from the slow cooker and let it rest before cutting - I sliced it into cubes, but you could slice it, if you prefer. The best part about this is that ir's just as good - or even better - the next day. The potatoes have a Facebook page, if you're interested. Cold mornings are here and I love a hot breakfast that warms me up and keeps my stomach happy until lunch. Traditional recipes for cooking oatmeal have always left me with a bowl of pasty, gluey gruel AND they took time AND stirring. I thought I would share two ways to make oatmeal worth eating. The first recipe gives you a bowl of chewy, yummy oatmeal AND takes less than 10 minutes AND you only have to stir it a few times - just to mix things up. The second oatmeal recipe has NO cooking, is put together before you go to bed, AND is company "brunch" worthy. Both recipes start with regular whole oats, NOT instant oats. 1. The Best Oatmeal I Have Ever Eaten! This recipe makes two generous servings. 1/3 to 1/2 cup of dried fruit - raisins, cranberries, cherries (my favorite), bananas, etc. Put on a lid and take the pan off the heat. Allow the pan to sit, off the heat, for 5 minutes. Remove lid and give things a good stir. Spoon oatmeal into a bowl and then get creative. Top with your favorite sweetener: honey, raw sugar, real maple syrup, brown sugar, ?? Toss in a small handful of walnuts, half of a banana, sliced, or half of an apple, chopped, or any fresh, frozen, or even canned fruit - whatever you have. Pour in a little milk and YUM!! The bowl of oatmeal pictured below has dried cherries, sliced bananas, walnuts, maple syrup, and milk. Now that is oatmeal worth eating! This is soooo simple and soooo good! The recipe is from my friend, Linda, and we used it for a healthy eating program we did for our local after-school program. The children LOVED it! They came back for seconds! - Before you go to bed mix regular oats and apple juice half and half. Cover and refrigerate over night. The amount is measured by the number of servings you will need. For example, one cup oats to one cup apple juice should be enough for two generous servings. - The next morning dish up a portion of the apple juice/oats mixture and top with vanilla yogurt and fresh fruit in season (strawberries, raspberries, blackberries, ??? ), or frozen or canned fruit when fresh is not available. You can also layer this in a parfait glass - oats, yogurt and fruit and it is company worthy. The pictured parfait was topped with frozen blueberries and mango chunks. I have made this with canned pineapple, peaches or pears. Use the juice from the can to mix with the oats and the fruit for the topping. Then - - add extra toppings that accent the juice and fruit. For instance if you use pineapple toss in some coconut. Use your imagination. A healthy breakfast is like a hug from Mom. Not a bad thing for any of us. Back in the stone age, you could get coffee with these interesting flavored syrups, but the only way you could buy the syrups for use at home was to talk someone at the coffee shop into selling you a bottle. It was it and miss whether there would be an unopened bottle in the flavor you wanted. Fast forward to now, and you can buy the flavors online and in stores. And thanks to Torani and SheSpeaks, I was able to sample a few flavors without doing any shopping. That's always a plus. One of the flavors I received was Pumpkin Pie Spice. I've run across that flavor profile a few times this season, but it's different every time. This time, it seemed just right to flavor some tea. The spices used in pumpkin pie are similar to the flavors in chai tea. A little less assertive, though. So I decided to brew some tea, add some flavor, and give it a try. The flavor was what I expected - chai-like, with a hint of fruitiness from the pumpkin. I don't usually add milk to tea, but it seemed just right in this one. You can use any tea you like, but I'd suggest an un-flavored black tea. If you must use a flavored tea, go with something simple, like a vanilla flavor that wouldn't clash with the pumpkin pie flavors. Put the brewed tea in your favorite cup. Add the syrup and milk Stir, taste, and adjust the flavors the way you like them. But ... if you're old enough, and you're inclined to do so, a little bit of brandy wouldn't hurt. Torani's got a few things going that you might be interested in. First, you can get 10% off your order at Torani.com through November 30 with the coupon code SHESPEAKS. This post was sponsored by Torani and SheSpeaks. Not that long ago, I posted about the turkey tacos I'd made using turkey legs that I braised specifically to make the tacos. Shortly after that, I decided I wanted to roast a turkey breast in a more traditional way. Instead of the usual mashed potatoes, I roasted potatoes along with the turkey. I guess that made up for the lack of stuffing. After I had a few sandwiches, I was ready to get a little more creative. This isn't much of a recipe - it's all about what you like, so the amount are up to you. Use more or less salsa, and whatever proportions of meat and potato you like. If you've got other left over vegetables that would make sense in a taco, add them. The great thing about this meal was that it was incredibly fast to throw together, since I was working with leftovers. I just cubed the turkey and potatoes, tossed them with a salsa I had on hand, and quickly heated them. I served this on tortillas, topped with my favorite lime-pickled red onions. So, ya wanna see what kind of crazy stuff I put together when I'm not being creative for the blog? This is a prime example. It's simple, it's filling and it used up left over turkey and some other odds and ends I had in the pantry and freezer. Yes, I know it's only Thanksgiving now and I'm talking about leftover turkey, but since I'm not doing Thanksgiving at home this year, I cooked some turkey early, and this used up the last of it. This stretched my leftovers into several more meals. Almost like free food. What else can a gal ask for? This would work just as well with chicken. As for the spinach, other frozen vegetables would be great, too. I almost reached for peas, but decided the spinach would be more interesting just this one time. And if you want something a little lighter than a bowl of noodles, there's an easy way around that - just add enough water to turn this into soup. There's enough concentrated stock here to make that work. You might want to add a pinch of salt, though. Melt the butter in a large pan (I used a large saucier) and add the onion, potato, and carrots. Cook, stirring as needed, until the vegetables begin to soften. Add the noodles and cook, stirring as needed, until the noodles are lightly toasted. Depending on the shape of the noodles, you might not get all the surfaces toasted. That doesn't matter. Add the turkey stock and cook, stirring as needed, until the noodles and vegetables are cooked through. If you need more liquid, add water, as needed. The goal is to have some liquid without this being soupy. Taste for seasoning when the liquid is about halfway absorbed. Whether you need salt or not is going to depend on how salty the stock was. And that depends on how salty the turkey was. Add salt, if needed. When the noodles are fully cooked, add the turkey and spinach, and continue cooking, stirring, until the turkey and spinach are warmed through. Serve with a squeeze of lemon juice, if desired. I like lemon with spinach so lemon made perfect sense to me. Ally Widlak, a mixologist from from Tahona (a local Boulder restaurant) recently competed in a national cocktail contest – the “Noble Places” Specialty Cocktail Competition. That's a mouthful, eh? It was hosted by Casa Noble (a boutique tequila distillery) at the House of Blues in Las Vegas. 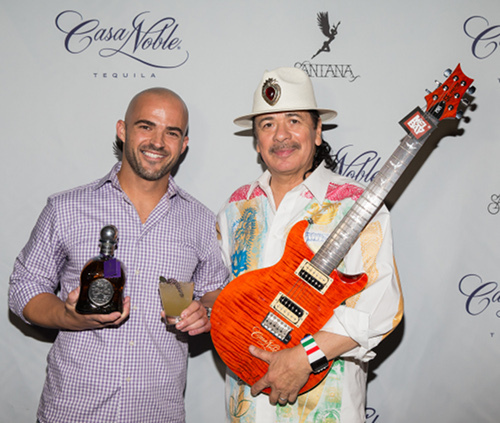 Cocktails from 10 mixologists were judged by a panel including musician Carlos Santana (part owner of Casa Noble), Casa Noble CEO Jose “Pepe” Hermosillo, and House of Blues Las Vegas GM Andrew Economon. Prizes included a guitar signed by Carlos Santana. Since Ally's a local gal, I was offered her recipe to publish, along with a few others. Sure, why not. It's just like a guest recipe post except more ... drink-like. All shaken over ice and served straight up in a Martini glass with an orange peel twist. Unfortunately, the local gal didn't win (awwww... bummer) but I do have the two winning cocktail recipes for you as well. Mix 'em up, and see what you think! Shake well. Serve in 12 oz Pilsner glass. For some reason I feel like dragging out one of my old Santana albums now. My favorite coffee cup - it's one of a kind. Ah, Dunkin' Donuts coffee... I don't remember when I first discovered that coffee, but I do remember thinking that it was such a shame it couldn't be brewed at home. Yes, I started drinking it that long ago. Way back in the stone age, when I was first dating Bob, there was a Dunkin' Donuts not far from where I lived. Conveniently, it was on the way to where he lived, and on my way to where my parents lived. I think my car knew automatically that it should turn into that parking lot to pick up a large coffee for the road. Maybe a donut. But always the coffee. Particularly when the weather turned cold and the car heater was a little unenthusiastic. Today when I was visiting my husband at the hospital, I reminded my him of that Dunkin' Donuts that we used to stop at and he grinned and nodded. Yup, it's a fond memory. Two large coffees, one with sugar and cream, one with just cream. One maple frosted donut, one marble frosted. There's a trip down memory lane. I can almost smell the maple. Okay, I'll admit that I had a particular fondness for those maple frosted donuts, too. But, dang, that coffee was sooooo good. And unlike some nostalgic foods that only the younger-me could love, I still adore a good cup of coffee. For me, coffee is one of those "homey" smells. Like baked bread. When I was a kid, mom didn't bake bread, but there was coffee every day. I wasn't allowed to drink it, but it was there, in the background. Morning, lunch, and sometimes after dinner. Coffee was a punctuation mark for the day. Funny how you associate things like that. In the morning, Dad had his first cup. I wasn't always awake - he got up at the crack of dawn, but there was that coffee smell wafting through the house. He worked close to home, so he came home every day for lunch and had a cup of coffee then, as well. And sometimes after dinner. And of course, whenever there were visitors, they were offered a cup of coffee as soon as they stepped in the door. On holidays, coffee was served after dinner and the adults lingered at the table. Eventually, I reached the coffee-drinking age, ordered it at restaurants, learned to brew my own, and started paying attention to beans. I might admit that I squealed just a little bit the first time I saw Dunkin' Donuts coffee in the grocery store. I'm serious. Squealed. Brought it home and said "LOOK what I FOUND!!!" Yeah, I'm a little crazy. But you expect that. And I really, honestly, giddily, love Dunkin' Donuts coffee. I can't explain why I love it so much, I just do. And for the folks who like a little variety, there are flavored coffees as well the original and decaf. 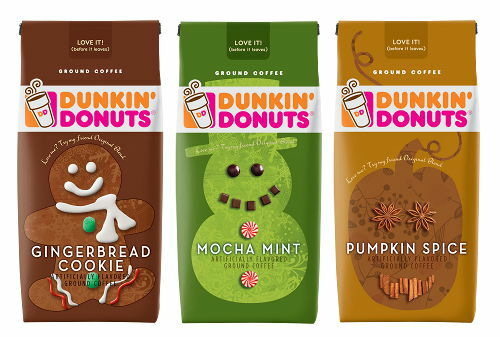 The limited edition ones you'll find now are Mocha Mint, Pumpkin Spice and Gingerbread Cookie. If you need a quick gift or a stocking stuffer, the seasonal bags have gift tags on them. Great last-minute hostess gift, eh? Is there a Dunkin Donuts in your area? Have you had their coffee? 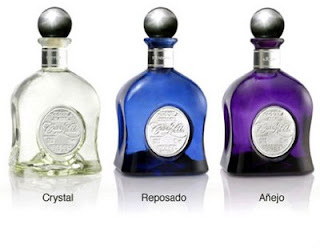 Are you going to try one of the flavored versions, or are you a purist? Tell me YOUR coffee story! On Thanksgiving, my husband will be celebrating 11 weeks in the hospital. Well, celebrating might not be the right word, but we continue to see gradual improvements, and that's something to be happy about. Despite that happiness, I'm really not in the mood for my usual Thanksgiving celebration this year. Not only is my husband not going to be home for Thanksgiving, but he's also not able to eat anything yet, so it's not like I could bring him a meal - not even mashed potatoes and gravy. And there's no way I want to spend a lot of time prepping and cooking a huge meal that would keep me away from the hospital. But that didn't stop me from buying a turkey. At this time of year, they're just about the cheapest meat you can buy. How could I pass that up? So I bought a turkey and disassembled it so I could make smaller meals from all the parts. A few days ago I roasted a breast half. The day after Thanksgiving is one of my favorite days of the year. The house is clean and all the usual chores are done, I'm looking forward to a few days off of work with no big obligations to do anything, and I have fantastic leftovers. That's what I was most looking forward to with that turkey breast - turkey sandwiches. The extras on this beauty were raspberry jam and Roth Horseradish & Chive Havarti cheese. Of course, if you've got cranberry sauce, you could use that instead of the raspberry jam. And then I pressed and warmed the sandwich in a sandwich press. Perfect! What's your favorite Thanksgiving leftover? Follow the #SundaySupper hashtag in Twitter to share your thoughts and get ideas before the big day-after. That darned turkey! Are you afraid of ruining it with your poor carving skilz? Hey, everything's online. Like this video on HOW TO CARVE A TURKEY. It's only one minute of video. It will take you a little longer than that to carve yours, but that's because you're going to be sneaking bits of crackly crispy skin and snagging a few bites as you go. What? You don't do that. Um, well, neither do I, I guess. And what goes with turkey? POTATOES. Here's a quick video on how to make mashed potatoes. I thought everyone grew up knowing how to make mashed potatoes, but given some of the un-good potatoes I've eaten, perhaps there are a few people who could benefit from this one. And really, there are good tips here. Last, but not least, let's have some vegetables. Or at least PRETEND we're having vegetables, as we stuff ourselves with stuffing and gravy. But really, if you're going to make vegetables, you might as well blanch them ahead of time. It keeps the color bright and makes the final cooking a little more civilized. I like blanching those little teeny fancy green beans - you know, the hairy corvairs? Or haricot verts, if you prefer. I like to blanch them, then give them a quick reheat on the stove in some butter before serving. This method works for a lot of different vegetables, actually. So there ya go. Three simple videos to help make your Thanksgiving just a teeny bit less stressful. Now pass the gravy, please. I'm going to say three words that are going to blow your mind. You've might have heard about that fancy cookie butter than so many foodies are cooing about. Yeah, me too. And then I thought, "why not do the same thing with other cookies?" Yes, I made Oreo cookie butter. Like peanut butter that tastes like Oreos and has no peanuts. Spreadable Oreo chocolate fudgy goodness. If you've ever had an Oreo cookie (and who hasn't?) you know that flavor. It's the perfect cookie to transform into something else, and have people say HUH? and wonder how you did it. It's so easy, it's embarrassing. It's almost not a recipe. It's magic. What can you do with this magic cookie butter goodness? Put the cookies in your food processor and process until you have a very very fine powder. Scrape down the sides and make sure you don't have any chunky pieces left. Keep processing until it's all a fine powder. Add the water a teaspoon at a time until you have a thick, shiny, fudgy spread. And that's it. Pure magic. *Note: I haven't tried this with the double-stuffed. I suspect it would take less water - maybe none. And then I thought, gee, considering how many of their tools I own, would I get anything new? The first thing I saw that I was over-the-moon about was the new ricer. This is the third ricer I've owned. The first one had a one-piece basket, so you couldn't select different sized holes. That was one downside, but the other was that it had holes on the sides as well as the bottom. So every time I used it, potatoes squished out the sides as well as the bottom. It was a bit of a mess. The second ricer had removeable bottom plates, but they simply slid into the bottom of the basket. About half the time, that plate would come up when I opened the lever to add more potatoes. It did the job well enough, but it was annoying to use. With the OXO ricer, you change the hole size by turning the bottom plate. Easy peasy. It works brilliantly. Just for the fun of it, I decided to see if it would mash graham crackers for my cheesecake. It worked pretty well, First, I smashed, then I shook the ricer like you'd shake a strainer. The small-enough bits fell through the holes and the larger pieces stayed in the basket to be smashed some more. This whole basket o' goodies is worth winning, just to get the ricer. The thermometer is pretty cool, and what I really appreciate is that not only does it give the USDA recommended temperatures for meats, it also displays the "chef recommended" temperatures. And it was easy to set. No need to read the directions. That's a plus. The most awesome thing about the thermometer might be that the probe stores neatly in a hole in the thermometer so it's not all loose and tangled up when you put it in a drawer. It's neat and compact. Less chance for the cable to get kinked, crimped, and cracked. Genius. The poultry shears, as I said in my post yesterday, are awesome because they come apart for cleaning. That's a huge selling point for me - actually one of the most important things to look for in poultry shears. Woah. Look at all that! The pot holders have a silcone coating, so if you're picking up something wet or steamy, you've got some protection. Thick cloth oven mitts are great, but if you're dealing with something wet and those mitts get wet - well, you might as well not have mitts at all. That's why these were great for handling that cake pan with hot water. And, they have magnets, so you can slap them on the refrigerator, AND they have a loop for hanging. They also work as trivets. The ones I got were red, but these come in a few different colors. There's also a turkey baster that includes a brush for cleaning it. Instead of a completely round squeeze bulb, it's an oval shape that's easier to grab. It comes apart easily for cleaning, and if you wanted to, you could store the cleaning brush inside the baster. I tried; it fits. There's a silicone brush that is slightly angled so when you put it on the counter, the brush end will be raised off the counter surface. Besides the usual thin brush strands, it also has thicker inner strands with holes that trap the basting liquid better. I remember seeing Alton Brown recommend a brush like this. Last but not least is a 4-cup fat separator. There's a plug that fits the spout so liquid doesn't immediately fill the spout. That means you won't have fat in that first bit you pour out. There's also a strainer that fits the top so you can strain out the large bits, bay leaves, or whatever else is in your stock. It's also got measurements on the side, so you can use it as a measuring cup. And who doesn't need an extra measuring cup? For your first entry, tell me which of the OXO products I described is the one you'd most like to own. That is the only mandatory entry. OPTIONAL entries - no particular order - do any that you like. Go to THIS POST and either pin one of the photos to Pinterest or Stumble the post. Come back here and leave a comment telling me what you did. Tweet "Win @OXO tools from Cookistry! http://su.pr/3cWpFO @dbcurrie" and then come back here and tell me that you tweeted. You can add something extra to that tweet if you like. Like OXO and Cookistry on Facebook and come back here and leave a comment that you've liked us. And that's it. One mandatory entry, three optional, and a whole LOT of awesome OXO tools you could win. This giveaway starts today and ends on November 21 at midnight, mountain time. All usual contest rules apply. OXO will ship the prize to the winner. Thanksgiving is a big food event. But what if you've got a small family? What if you're flying solo? What if you want to save money by buying an extra turkey, but you don't want to eat another traditional stuffed bird in a month or three? What if you don't want a traditional bird at all? And what if you want to top it off with a small but decadent dessert? This year, I think I fit the "all of the above" category. Or most of them, anyway. With my husband still in the hospital, cooking a big Thanksgiving meal is not on my radar. But I love turkey. And I love a bargain. So I bought a 14-pound turkey and went to work. When it comes to poultry, I love dark meat. When it comes to turkey, my least-favorite part is the legs. Or, more accurately, they're my least favorite part on turkey that's cooked the traditional way. The meat is never tender and it's impossible to cut into nice pieces for sandwiches. I'd rather have thighs. Heck, I prefer breast meat, if it's not overcooked. But if you treat those legs differently - cook them like the tough meat they are - well, you get nice, tender meat. It's still not great for slicing, but it's perfect for shredding. And perfect for ... TACOS! Yep, turkey tacos. And they were incredibly good. But before we get to making the tacos, let's talk about dismantling a turkey. If you've ever cut up a chicken, it's the same thing, only bigger. The bones are a sturdier. But it's the same thing. A good, sharp knife and a pair of poultry shears makes the job easier. I really love the OXO shears for two reasons. First, they do the job well. And second, they come apart. That means you don't have to worry about bits of stuff sticking in the hinge. When you're dealing with raw poultry, that's a big deal. When I was done, I had two legs, two thighs, and two breast halves. The back, wings, and the rest of the carcass went into the oven for roasting. The thighs and breast halves were wrapped and frozen. Meanwhile, the legs went into the slow cooker, not quite covered with water, and I cooked them on low until they were fork tender - about 4 hours. I took the legs out of the slow cooker and let them cool a bit and then the roasted turkey went into the slow cooker (less some parts saved for nibbling) to make stock. That's not part of the turkey taco recipe, though, but if you decide to disassemble a turkey, it's a good way of handling it. The turkey legs can be shredded immediately, or you can refrigerate them and shred the next day. The sauce is based on a very simple pepper sauce that I make quite often, but this time I pushed it a little further with some spices and chocolate. It's not mole, but it flirts with the idea of mole. You can find adobo seasoning in just about any store these days. Some have a lot of salt; some have very little. That's why you need to taste and adjust seasonings at the end. When the tacos are assembled, you can add whatever toppings you like. I opted for some shredded cabbage and lime-pickled red onions. I also tried a some of my spicy pickled cauliflower on some. Avocado chunks or guacamole would also work well. Shred the cooked turkey meat and add it to a small skillet. Add the pepper sauce, adobo seasoning, and chocolate. Cook, stirring as needed, until the liquid is mostly gone and you have shredded turkey in a thick sauce. Serve on tortillas with your choice of toppings. Going with the theme of dinner for just a few people - or just one (with leftovers, which is the best part of Thanksgiving) I made a very small cheesecake - just four inches in diameter. As much as I like cheesecake, most recipes are huge - for serving 8 or 12 or 14 people. That's way too much for me to make on a regular basis, and way too much even when we've got company. Have you ever used a ricer to crush crackers? Preheat the oven to 325 degrees. Wrap the outside of a 4-inch springform pan with aluminum foil. Crush the graham crackers. You should have about 1/4 cup of crumbs. If not, crush some more. Mix the crackers crumbs with the salt and sugar. Melt the butter and mix it with the crumbs until they're evenly moistened. Press the crumbs into the bottom of a 4-inch springform pan. Set aside. Cream the cream cheese and sugar together in a medium bowl. Add the pumpkin, egg yolk, cinnamon, nutmeg, salt, and vanilla extra. Beat until thoroughly combined. Pour this mixture into the springform pan. Place the springform pan in a cake pan or other ovenproof container. Add about an inch of hot water to the cake pan. Bake at 325 degrees for 35 minutes. When the cheesecake is done, it will still move a bit when you jiggle it, but it shouldn't be sloppy wet looking. Take the pan out of oven (carefully! You've got really hot water there! ), remove the springform pan, and let it cool for about 15 minutes, then refrigerate for at least 4 hours before removing the cheesecake from the pan and slicing. Did I mention that this post is sponsored by OXO and that there's a really AWESOME giveaway right HERE? And I'll tell you about some of the tools I used and why I love 'em. Oh yeah, you're going to absolutely love it! No, that's not my creation. Photo courtesy of OREO. This Friday, November 16, I'm going to have a fun opportunity for you to win some awesome prizes from OREO and Kitchen PLAY. I think you'll like it. And hey, there's nothing wrong with having an excuse to pick up a package of OREOs, right? 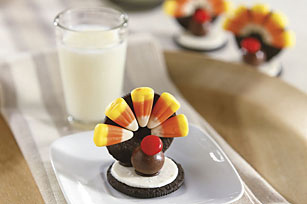 There will be two OREO Thanksgiving prize packs filled with goodies like a Crate & Barrel serving platter and pie server, an exclusive OREO cookbook and other fabulous treats, valued at $70. Woah! That's pretty good, right? And WAIT until you see the recipe I've come up with! You'll either think I'm a genius or I'm crazy. But that's pretty usual. To enter, all you have to do is recreate any OREO dessert from this week's Kitchen PLAY event or come up with your own. (But I think you'll want to make MINE!!!) Post about it on your site and provide a link to that post in the comments on this Kitchen PLAY page. NOT here on my blog - you've got to go to Kitchen PLAY to win. Multiple entries are allowed, as long as a separate OREO dessert post is created for each entry. Deadline is midnight PT on November 28. This sweepstakes will also take place again at the holidays, so the earlier you enter, the more chances to win! Full sweepstakes guidelines are at Kitchen PLAY. Don't forget. Friday. Crazy OREO recipe. You could win stuff.